When it comes to famous celebrity parents, one of the first couples we think of is Angelina Jolie and Brad Pitt. Seriously, I don't think the universe will ever recover from the fact that these two split, but luckily they have a whole army of kids that still reminds us of their happier days. Now anyone who has been following the news recently knows that there has been quite a bit of drama in the former couple's custody battle, with reported fights, poor choice of words, and Brad not getting to see his kids much. Whatever the situation might be, we do really hope the couple has their kids' best interest in their minds, and that they don't let their own feelings cloud their judgment. 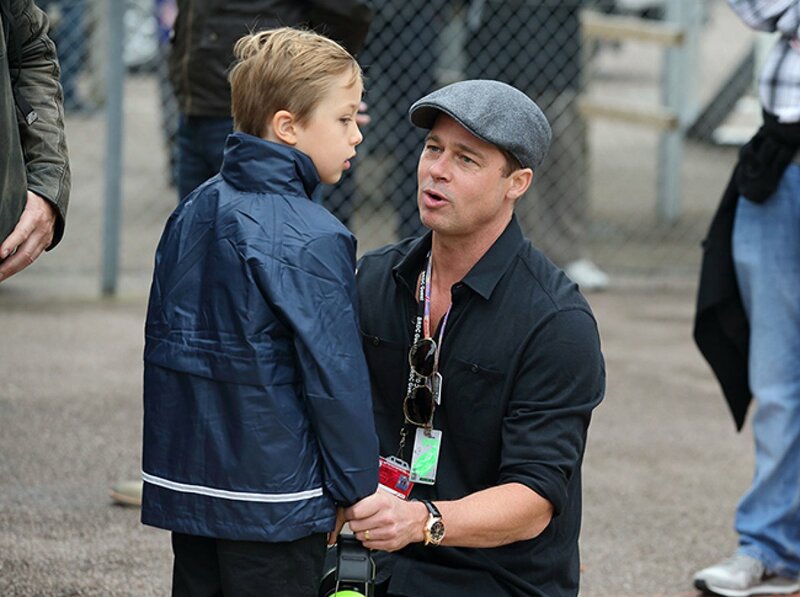 And well, since there has been so much talk about Brad Pitt being a bad father recently, we wanted to assemble a list to show everyone that Brad knows how to be a good dad, and he's been one for a long time. Judging someone by a mistake or two is so easy when that person is in the public eye, but the fact is every parent makes a mistake at some point, and then they just learn from it and move on. 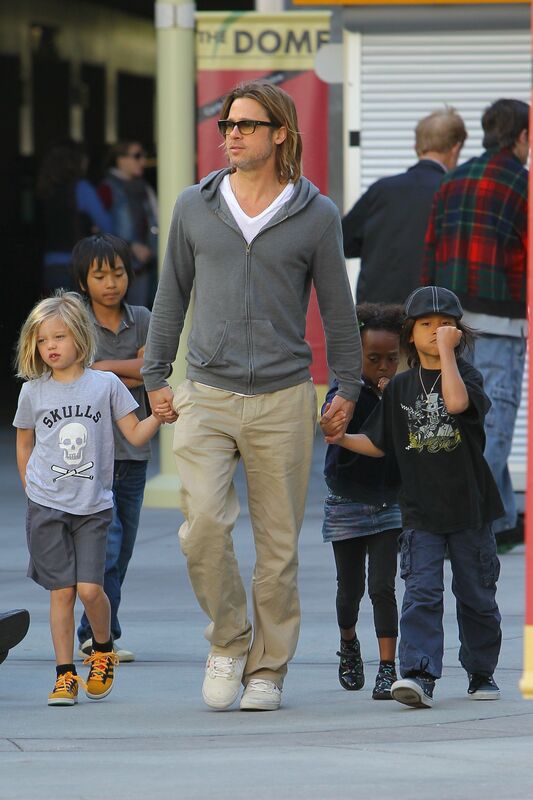 Either way, here are 20 photos that prove Brad Pitt isn't so bad at parenting after all. When Angelina Jolie premiered her movie Unbroken, a movie she actually directed, Brad was in charge of bringing the kids to the red carpet to support their mom. Of course, since the movie is about World War II and not quite PG13, not all kids were old enough to see it, but Brad decided to bring along Pax, Maddox, and Shiloh. And judging from the red carpet pics, the three seem to have been thrilled to attend the premiere of their moms work. It definitely looked like the three had a great time with their dad, and why wouldn't they? 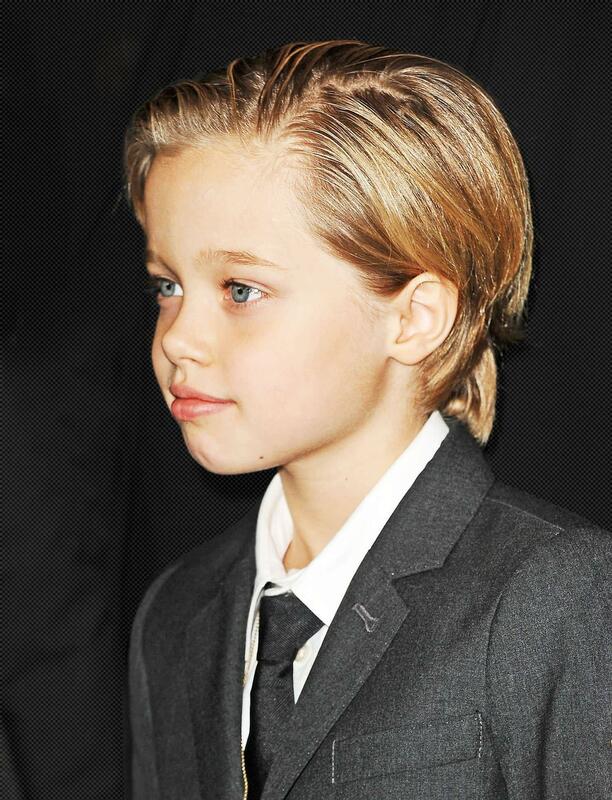 And speaking of the premiere of Unbroken, everyone couldn't stop talking about Shiloh's outfit. By now we all know her parents let her wear whatever she wants, and she tends to like wearing things from the boy's section of the store more, but this premiere sort of made her gender-fluidity official. And daddy Brad was there fully supporting it. It is nice to see celebrity parents who allow their kids to be what they want, and who don't force their children to subject to any social stereotypes. And when it comes to this aspect of parenthood, Brad is an amazing dad! Seeing celebrity parents with their kids playing in a park reminds us that even though they are living this life of glitz and glam, their parenting life isn't much different from ours. So here's Brad having a dandy good time with Pax And Zahara, helping them climb the park's playground while still making sure both of them are safe. Nope, Brad is not a dad who sits on the bench just keeping an eye on his kids, Brad is the dad who runs along with his kids, inspires them t have fun and is always up for any fun activities. Honestly, which kid wouldn't love to see The Little Mermaid on Broadway? 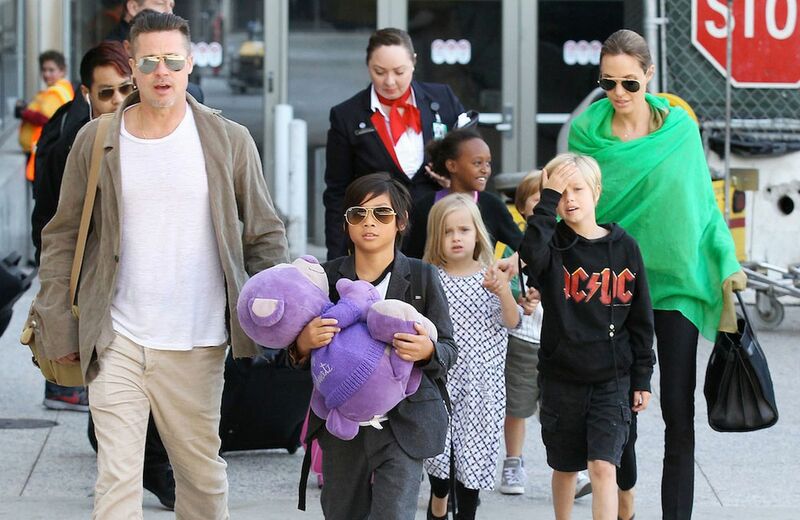 I'm an adult and I am jealous that Brad and Angelina took their four older kids for a fun night out to see it. 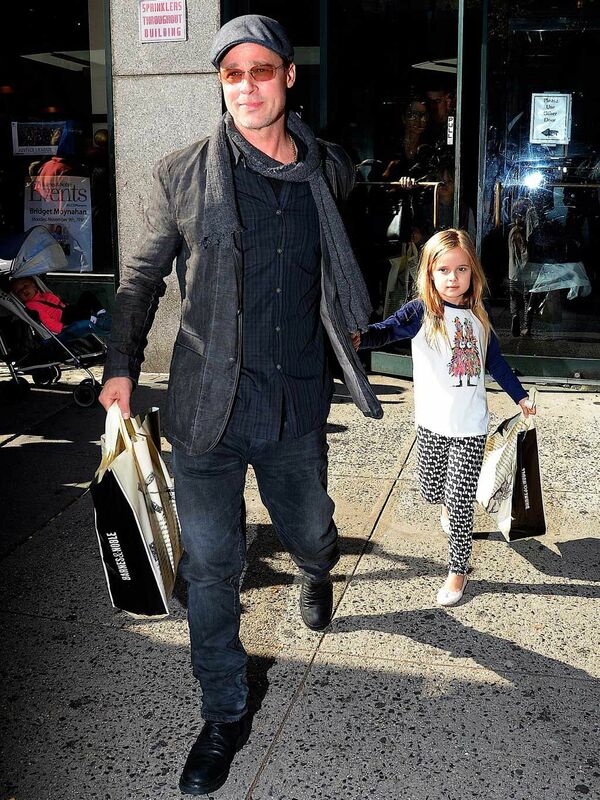 While Angie was looking after Maddox and Zahara, Brad was in charge of Shiloh and Pax. And as you can see, he is the epitome of a good dad, because: exhibit A - Shiloh asked to be carried and he immediately obliged like the good dad he is; and exhibit B - he bought Pax whatever bubbly drink the little one wanted because kids should be spoiled every now and then. Let's not forget about his youngest kids, the adorable twins Vivienne and Knox. here they are together with their dad who just bought them a ton of doughnuts. Okay, we might be wrong, but doesn't that look like two dozens of doughnuts? It must be great to be Brad's kid because even though you have to share your doughnuts with five other siblings, two dozens still mean four doughnuts per child. And isn't that every kid's dream, tbh? Okay, to be fair, we're pretty sure the kids didn't get four doughnuts each, but the fact that Brad got them any doughnuts deserves to be mentioned on this list. Sometimes a good dad just takes their kids out for a walk, because exercise and fresh air are important. And taking four kids out at the same time isn't always an easy task, but Brad, being the good dad that he is, has no trouble with it what so ever. The kids seem to be having a good time (especially Pax who clearly feels like a winner), and that's what parenting is about most of the time. Walking around a city with your kids when you're a celeb is not easy at all because paparazzi will follow you everywhere, but Brad is managing just fine. Honestly, how impressive are Brad's parenting skills here? Picking up and carrying not just one child at a time, but two of them? Pax and Zahara are definitely two lucky kids, cause their dad is a very strong man and he won't say no to carrying them when they want to. And when you're a kid isn't being carried around and being as tall as an adult one of the most exciting things that can happen to you? Also, side note - can we just point out how stylish Brad looks while doing all of this? I mean look at his shades and the hat, this daddy has a cool look going on. If you thought Brad Pitt only carried two at a time a couple of times, you're definitely wrong, because there are plenty of pics of him doing this with his children, which is why we had to include another entry, to prove how extremely cool he always looks. Seriously, here he is holding twins, Vivienne And Knox while rocking a beanie and shades, proving that Boney M.'s song "Daddy Cool" must have been written for him because Brad is one cool (and very strong), daddy. Okay, now this is the last pic of Brad carrying two of his kids we promise! Kids will always be kids, and sometimes they'll want to carry big unnecessary toys around with them, and any good parent out there should know that letting them do it is the best way to teach them to take care of their things. So here's Pax, thrilled about his teddy that he himself needs to carry and take care of. Of course, Brad will still keep an eye on the teddy to make sure Pax doesn't lose or misplace it but giving a child some responsibility for their own toys is a great thing that parents can do early on. And Brad knows that. Okay, let's just be clear on this: it's definitely a stereotype that girls love to go shopping more than guys do, and that a good daddy should take his little girl to the mall to make her happy. But hey, sometimes that's kinda right and honestly, there should be nothing wrong with it! We bet Brad also takes his sons out for a shopping spree every now and then as well, and we bet they all enjoy it. But here it was little Vivienne's turn, and judging from the bags the two are carrying, it must have been a successful father-daughter bonding and shopping session. Which kid wouldn't love to go zip lining and experience an adventure? Okay, granted this is definitely the kiddo version of it in a park, but hey for kids that's still pretty exciting. So here's Brad with young Shiloh, making sure she's zipped up properly and nothing goes wrong. And Shiloh is clearly just excited to do some fun stuff, as you can definitely tell from the expression on her face! Spending time with your kids and doing fun stuff, but still making sure they're safe is the best way to be a good dad. Props to Brad Pitt for already knowing that! Sometimes kids need a little assistance for all these modern and exciting playgrounds because let's be real, falling and hurting yourself sounds like such a bad idea. But lucky Shiloh always has daddy Brad on her side, ready to help her up, down and conquer all these exciting obstacles and fun playground activities she comes across. As we already said, Brad is not the "sitting on a bench watching his kids play" kind of dad, Brad is the type to play along with them. And as a kid, having a fun grown up with on your adventures is just great! 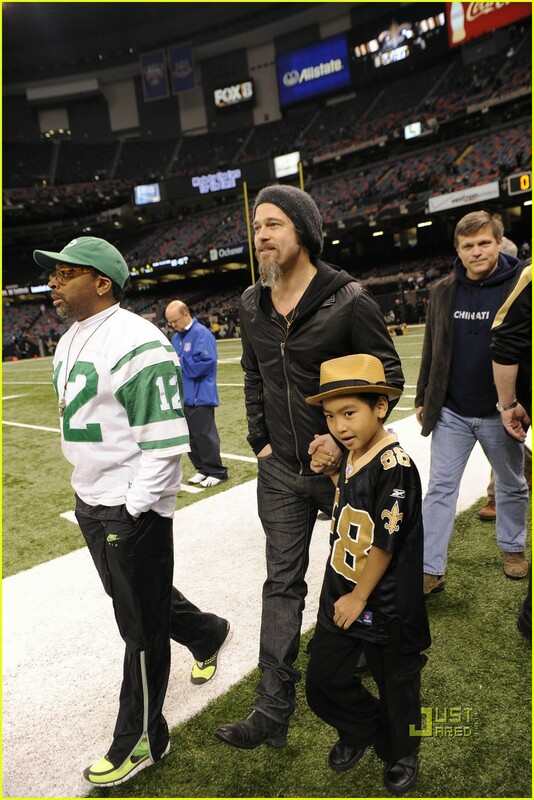 Brad also took little Madox to a New Orleans football game, and come on, is that isn't a good daddy, then we don't know what is! Seriously, Madox was super thrilled and excited to go to a sporting event with his dad all alone, as one-on-one time is pretty important for kids who have a bunch of siblings, and well, Madox has five. Brad clearly knows how crucial it is to give some quality time to each of his kids and make sure the activity they do is unique to them and in accordance with their hobbies and preferences. This is probably one of our favorite pics on this list, just because it's pretty hilarious how grumpy and unsatisfied little Zahara is with the situation. She clearly wanted to be the tallest one and sit on her dad's shoulder, but this time around it was Pax's turn. And obviously, Pax is thrilled about it. It's often hard to make sure every child feels special, and that the siblings aren't too jealous of each other, but Brad seems to have figured that out by letting them rotate every now and then. And here it was Pax's turn which is why Zahara didn't say anything, but she still couldn't hide her feelings well. But hey, don't worry, little Zahara spent plenty of time on her daddy's shoulders. 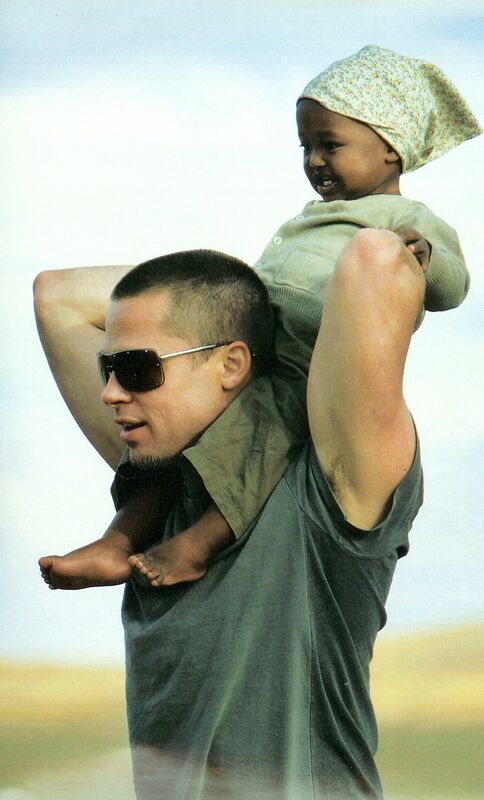 In fact, she was probably the most photographed kid on Brad Pitt's shoulders, and that says a lot about how much she loved that. There's just something about kids loving to be on their parent's shoulders and feeling super tall and seeing the world from another perspective. When you're young that almost seems like flying, and it's an adventure Zahara was always up for! You can tell by her adorable smile that this girl is living her best life, and none of her siblings (especially not pax) can take that away from her! When Shiloh was still a little baby these pics of Brad lovingly staring at her made their round, and honestly, the pics still make our heart melt! You can tell Brad is super excited to see little Shiloh grow, evolve and become who she's meant too, and we believe nothing has changed. He still wants that for Shiloh, and all of his other five kids, and when a parent is caught staring so lovingly at their offspring, you know they are bound to be a good parent. Sure, everyone makes mistakes, but loving your child is the most important part of parenting, and that one should always be there. Now here's Brad talking to his youngest boy, Knox, probably giving him some important fatherly life advice. Being able to talk to your children, have them listen and understand, as well as come to you when they need help or advice is what every parent should strive for, and Brad is clearly aware of that. We like to think that he's sharing some important secret with Knox like what the rules of Fight Club are, but for all, we know he could actually just be asking Knox what he'd like to eat for dinner. Either way, communication is very important! Parents are generally always our number one fans no matter what we do or how well we do it, and Brad is living proof of that. Here he is supporting Zahara at a soccer match, probably giving her some tips on how to score against the enemy - as if she needs that! Either way, it's good to see that someone as busy as Brad Pitt still always finds time to attend his kids' extracurricular activities and cheer for them from the sideline. Every kid deserves that, and just because one is a world-famous actor, that doesn't mean he can excuse himself from this. 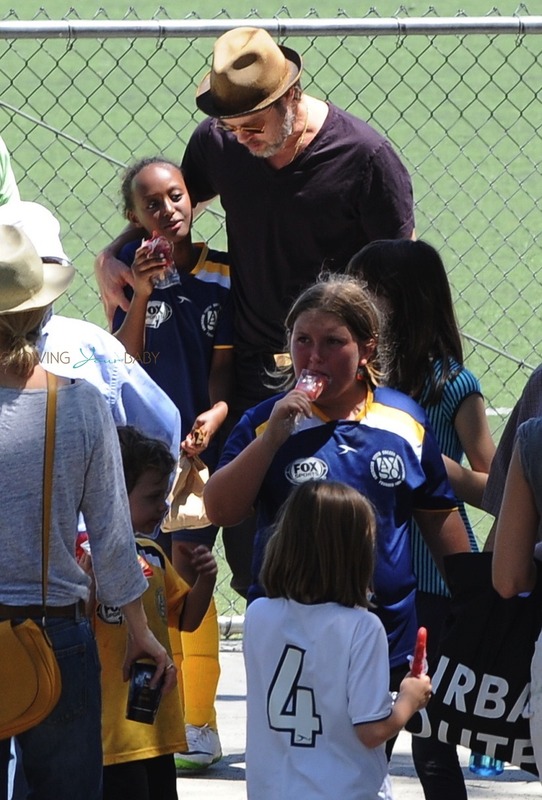 Of course, Shiloh was also participating in the soccer game, and Brad made sure to exchange some words with her before the match as well. Besides any parent who is supportive of their children's extracurricular activities and teaches them that exercising your body can be a fun thing is a parent that is doing something right. You can tell that Brad is definitely trying to give his kids as normal a life as possible, considering the circumstances, and we believe he is so far managing to do so. And we bet Shiloh was happy to have her dad cheer from the bleachers! 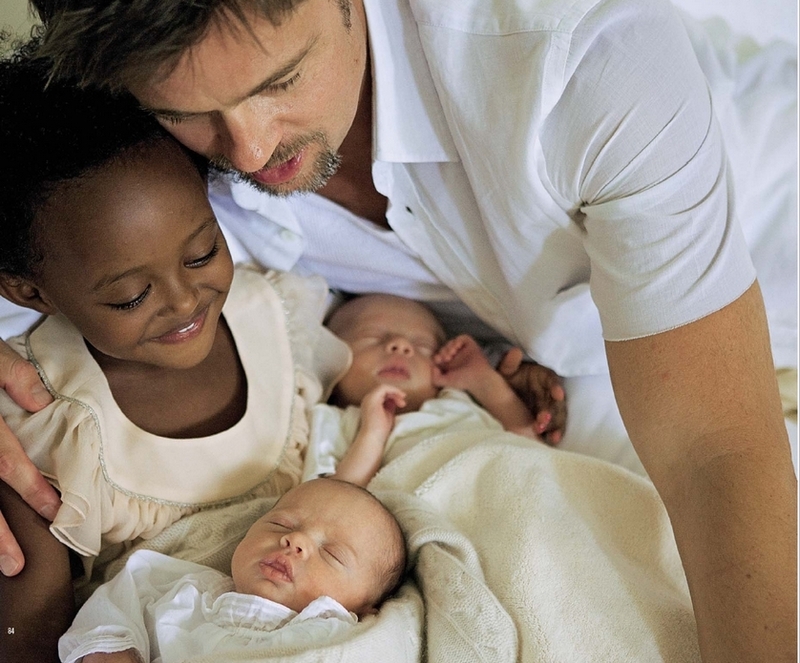 The last pic we decided to include is a family portrait with Brad, Zahara and his, at the time, newborn twins Vivienne and Knox. The photo is absolutely beautiful and everyone in it looks just adorable and happy. Hope you enjoyed this little list of pics that show Brad isn't doing such a shabby job at parenting after all, and his kids always seem to be happy when they're hanging with him. Having six kids is definitely not an easy job, but he (and Angelina) seem to be doing parenting the right way so far, regardless of what's going on between them.